YOU’RE INVITED! 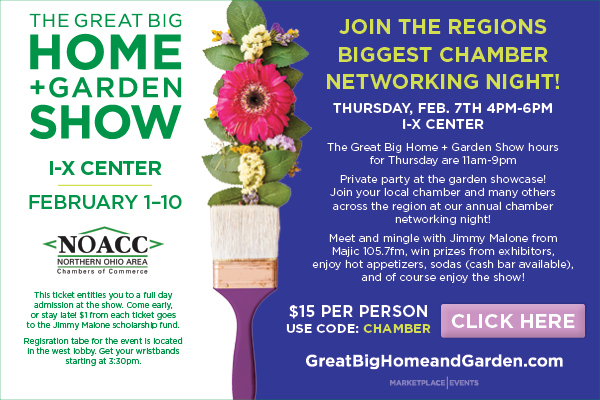 Let’s kick off the new year with the Sixth Annual Great Big Chamber Networking Night at the Great Big Home & Garden Show at the I-X Center (near Cleveland Hopkins Airport) on Thursday, February 7th from 4-6 pm. A $15 ticket will give you entrance to the show from 11 am-9 pm and the Chamber Networking Night Private Party from 4-6 pm that will include GREAT appetizers, sodas, cash bar, prizes from exhibitors and MORE! All the information is on the form below, and tickets can be purchased by clicking the link below. This is a great way to expand your networking reach and meet like-minded chamber members from many chambers, all across Northeast Ohio. Everyone had a great time last year and we expect an even bigger crowd this year! This is a GREAT networking opportunity for everyone, and lots of fun too. For more details visit:www.greatbighomeandgarden.com. Use the promo code “CHAMBER” to buy your ticket.